It’s not often that I feel any longing to return to London, my two years of grey skies and shoebox living was more than enough for me. However I would love to be there to see this. 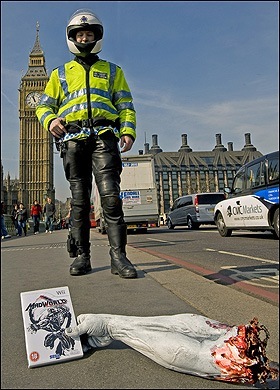 SEGA have decided that the most logical way to promote their hugely brutal MadWorld title would be to scatter some fake arms all over the city with a copy of MadWorld wedged into the hand. Apparently the limbs are being monitored to make sure that they don’t offend anyoneâ€¦ somehow I think they are really being monitored to make sure they don’t grow legs and disappear as I would love to get one of those nailed to my wall. This got me thinking though, what is the marketing campaign you have ever come across? The Resident Evil marketers also scattered body parts over London and had that blood drive in LA but has someone done something really impressive? Next article The PS3 is not catching the Xbox 360!